As a woman you might agonize over the size of your breasts. Some women may want their breasts to be larger, while others suffer from back pain and desperately want to decrease their bust size. As you participate in exercise, your body burns calories and builds muscle, which can lead to physical changes. To understand how exercise will affect your breast size, you need to understand what your breasts are made of and how exercise affects your whole body. Regardless of the size of your breasts, all women have the same basic anatomy. Your breasts are made up of connective tissue, blood vessels, lymph nodes, lobes, lobules, milk ducts and fat. Fat tissue, or adipose tissue, makes up the majority of your breasts and accounts for the size. The size of your breasts varies based on genetics, pregnancy and the amount of fat in your body. When your body experiences a shift in body fat percentage, you might see this change in your breasts first. Strength training is designed to condition your muscles. You can use your own weight, resistance bands, free weights or weighted machines during an exercise. Strength training can help you to build new muscle tissues as well as tone your current muscles. When you focus on the pectoral muscles of your chest, you can alter the appearance of your breasts. Exercises such as pushups, the chest press and the chest fly are beneficial pectoral exercises. If you build new muscle tissue in this area, you can lift and firm your breasts. If you have smaller breasts, it's likely that you might even experience an increase in your chest region. Aerobic exercise improves cardiovascular health. 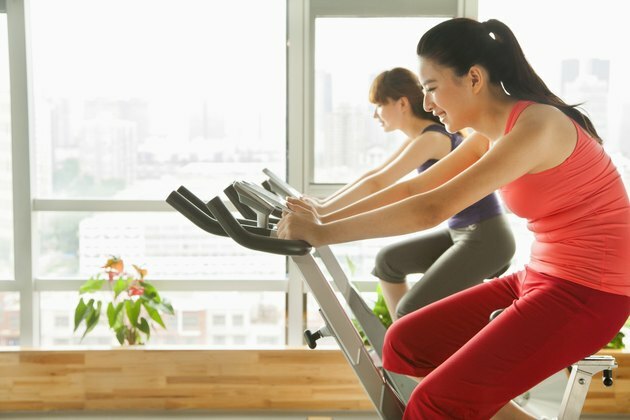 Exercises such as jogging, tennis, elliptical trainer and swimming are all forms of aerobic exercise. When you engage in this form of activity, your body builds muscles while burning calories. Even if you increase your calorie intake to maintain your weight, your overall body fat ratio decreases. Because your breasts are mostly fat, they are likely to become smaller as your activity level increases. When daily aerobic exercise is used in conjunction with a healthy, low-calorie diet, you create a calorie deficit, which results in weight loss. A deficit of 3,500 calories per week leads to a loss of 1 pound. Because your body stores energy as fat, each pound lost reduces your overall body fat. Thus, while you're working to lose weight, it's normal to find that your breasts are the first place that visibly show your reduced levels of body fat.